Easy to use - Simply add water! The PROTEOSTAT® Protein Aggregation standards are ideal for reliable and accurate quantification of protein aggregation in solution. The standards are used to determine low levels of aggregated protein in a sample by comparing the assay response of a test sample to that of the standard curve; comprised of standards with known concentrations of aggregated IgG. Protein test samples and protein aggregation standards should be analyzed in the same manner, by mixing them with detection reagent and using a fluorescence microplate reader to measure the fluorescence intensity values. As with any protein assay, different protein aggregates will elicit slightly greater or lesser fluorescence intensity response based upon their inherent amino acid composition and sequence. It is recommended that a standard curve be prepared each time the PROTEOSTAT® Protein Aggregation assay (Prod. No. ENZ-51023) is performed. The PROTEOSTAT® Protein Aggregation standards contain stabilized, high-quality reference samples for generating an accurate standard curve. The standard curve is formulated from different amounts of aggregated IgG, combined with monomeric IgG. Once reconstituted, the samples contain 12.5%, 6.25%, 3.13%, 1.56%, 0.78%, 0.39%, 0.20% and 0% aggregated protein, while the total protein concentration of each standard is maintained at 1mg/ml. 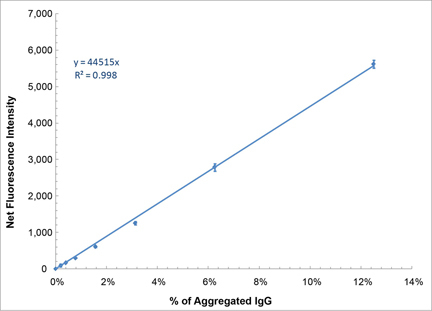 The total protein concentration of the IgG standard has been calibrated by direct comparison to an internal protein standard, in order to ensure lot-to-lot consistency and accuracy. Orthogonal characterization methods, including laser-based nanoparticle tracking and micro-flow imaging, have been employed to validate monomer integrity during manufacturing. Figure 1: Typical standard curve produced using the PROTEOSTAT® Protein Aggregation standards. Application Notes: This kit is ideal for reliable and accurate quantification of protein aggregation in solution. The standards are used to determine low levels of aggregated protein in a sample by comparing the assay response of a test sample to that of the standard curve; comprised of standards with known concentrations of aggregated IgG. Quality Control: A sample from each lot of PROTEOSTAT® Protein Aggregation Standards is used with the procedures described in the user manual. Perform assay with 12.5% - 0% Aggregate in duplicate. Linear curve R-Square has to be greater than 0.95. Handling: Do not vortex or centrifuge at high speed. Avoid freeze-thaw cycles, as this can promote further aggregation of the standards. This product is manufactured and sold by ENZO LIFE SCIENCES, INC. for research use only by the end-user in the research market and is not intended for diagnostic or therapeutic use. Purchase does not include any right or license to use, develop or otherwise exploit this product commercially. Any commercial use, development or exploitation of this product or development using this product without the express prior written authorization of ENZO LIFE SCIENCES, INC. is strictly prohibited.